Former ACCEPT and current U.D.O. 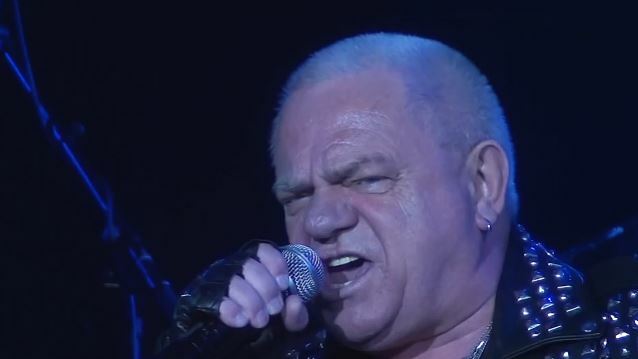 singer Udo Dirkschneider was interviewed by rock journalist Mitch Lafon for a recent edition of the "One On One With Mitch Lafon" podcast (Facebook page). You can now listen to the chat using the Spreaker widget below. A couple of excerpts follow (transcribed by BLABBERMOUTH.NET). "A lot of people ask me, 'Why do you do this?' And I said… Always people are asking, 'Oh, can you play this ACCEPT song and this ACCEPT song and this ACCEPT song?' I mean, I have fifteen U.D.O. albums out, and, for me now, U.D.O. is U.D.O. Of course, I know that the people like to hear ACCEPT songs with my voice, but I wanna close something — I wanna close, like a book, and say, 'Okay, that's it. I read it.' Sometimes you have to come to an end with something. I wanna close up everything with ACCEPT. And this will be the last time. And I said, okay, I'll do one more tour. It will be a world tour. Hopefully we can do this also for America, around maybe a couple of shows. And yeah, that will be the last time that you… When we are on tour with U.D.O., we'll never play any ACCEPT songs again." "I also wanna stop to be compared with… Now ACCEPT is still on tour, and they have a new singer, and they are doing also 'Balls To The Wall' and they are doing also 'Metal Heart', they do 'Princess Of The Dawn'. And I don't wanna be always compared and have to say, 'What do you think about this and this and this?' This is also another reason. I wanna close the ACCEPT chapter. I mean, it was a great… I mean, in a way, I was creating this band, you know. Sometimes you have to say, 'Okay, that's it.' I have enough U.D.O. songs, so I can play more U.D.O. songs and be U.D.O. I can say without being arrogant, U.D.O. has its own fan base now. Sometimes you have to say, 'Okay, that's it.'" "There is a band called ACCEPT. And please, if you wanna hear these songs, please go then to [see] ACCEPT. [Laughs] So that's the only thing I can say. Now you'll have the chance next year to hear it with the original voice, but Mark [Tornillo, current ACCEPT singer] is doing a — I would say — really good job on it, so please go there and listen then to ACCEPT and U.D.O. is then U.D.O." "I don't know what is special. You never can tell it, really. Like [DEEP PURPLE's] 'Smoke On The Water', in a way, something like this. Sometimes there's a song that, in a way, that stays forever." "No. I mean, I just keep going. For me, it's always important, as long as my voice is working, [which] it works, so I think I'm really lucky. And the most important thing for me is I still have fun to do this. I still have fun to be on tour. I have a really good chemistry going on in the band. It's a lot of fun with these guys. They push me also. So we will see. Maybe I can do it for… If nothing happens with my health or something like that, maybe… I don't know… Ten years. I don't know… We will see." "Yeah, I think. Normally the record company says, Oh, you put out so [much] stuff. We have to suffer.' But I think definitely I can say there will be a live CD out. Definitely. I mean, you have to do this. It will never happen again like this. And I think you have to put this on a CD. What was very interesting [was that] the record company came up with this. They said, 'We have to do this.' And I said, 'Yes, I know.' [Laughs]"